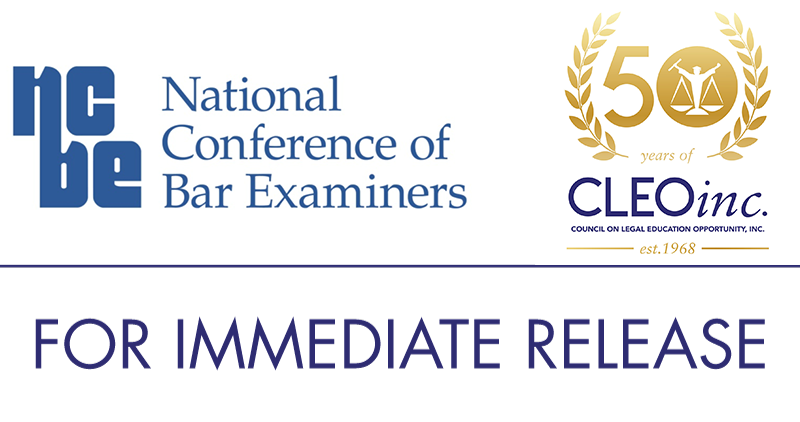 Madison, Wisconsin and Largo, Maryland – October 26, 2018 – The National Conference of Bar Examiners (NCBE) and the Council on Legal Education Opportunity, Inc. (CLEO) are pleased to announce a new collaboration in support of their shared goal of increasing diversity and inclusion in the legal profession. NCBE has provided funding to bolster CLEO’s programs that help individuals from traditionally underrepresented racial and ethnic groups and disadvantaged communities achieve success in law school and prepare to take and pass the bar exam. For over 50 years, CLEO has successfully contributed to increasing the number of lawyers from diverse backgrounds in all sectors of law. “Diversification of the legal profession is a top priority for legal education and admissions stakeholders at all levels. We are proud to partner with CLEO and support programs with a strong track record of helping prepare underrepresented groups for law school and bar exam success,” said Judith A. Gundersen, NCBE President and CEO. CLEO, Inc., is committed to diversifying the legal profession by expanding legal education opportunities for individuals from traditionally underrepresented racial and ethnic groups and disadvantaged communities. Founded in 1968 when the number of lawyers of color was less than one percent, more than 10,000 individuals have participated in CLEO’s programs, many of whom have gone on to excel in every area of the legal profession to include judges, corporate attorneys, law school deans and professors, practitioners, politicians, and more. Although best known for its Pre-Law Summer Institute “boot camp” for entering law students, CLEO provides services to secondary, college (pre-law), and law school students, which include mentoring, placement assistance, academic counseling and support, bar prep orientation, and scholarships. For information about CLEO, Inc., and its programs, please visit: www.cleoinc.org. For more information about CLEO’s historic 50th Anniversary and corresponding celebrations, please visit: www.cleoinc.org/50. The National Conference of Bar Examiners, headquartered in Madison, Wisconsin, is a not-for-profit corporation founded in 1931. NCBE develops the licensing tests used by most states for admission to the bar. NCBE stakeholders and constituents include state Supreme Courts, state attorney licensing boards, attorneys, and law school deans. NCBE is governed by a national board of trustees consisting of judges, bar examiners, and bar admission administrators. Approximately 71,000 law school graduates sat for the bar exam in 2017. For more information, see the NCBE website at www.ncbex.org.